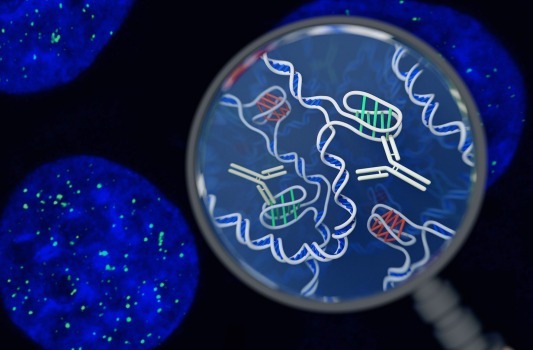 Scientists have identified a new DNA structure in human cells. It’s in the form of a twisted knot and it exists alongside the well-known double helix. This form resembles a twisted “knot” of DNA, instead of the well-known double helix first described by James Watson and Francis Crick. Lab work has previously suggested the existence of DNA in this form, but this is the first time it has been observed in living cells. The scientists are not exactly sure what the function the i-motif is, but they suspect it is involved with the process of “reading” DNA sequences and converting them into useful substances. “When most of us think of DNA, we think of the double helix,” said Professor Daniel Christ, a molecular biologist at the Garvan Institute of Medical Research, who co-led the study describing the new findings. While i-motifs have previously been observed under artificial conditions in laboratories, prior to this work it was unclear whether they existed in living cells. A conventional strand of DNA is made up of “base pairings”. The building blocks of the double helix are substances called bases – adenine, thymine, cytosine and guanine. Generally speaking, the structure of the molecule comes from adenine binding with thymine and cytosine binding with guanine, but this is not the case with the i-motif. In order to locate the i-motifs inside human cells, the scientists designed tiny probes that could recognise the DNA knots. The probes were made using antibodies – Y-shaped molecules that bind with specific substances. In this case, the antibody was engineered so that it would attach itself to i-motifs but not to any other form of DNA. The scientists added fluorescent dyes to the antibody probes, meaning they could then monitor where exactly the i-motifs were located in the cells. When they applied their probes to three different varieties of human cells, they identified fluorescent green spots appearing in the nucleus of each cell they looked at. “What excited us most is that we could see the green spots – the i-motifs – appearing and disappearing over time, so we know that they are forming, dissolving and forming again,” said Dr Mahdi Zeraati, whose research underpins the new paper. The researchers also think this transient nature is the reason this form of DNA has eluded scientists for so long.